Delta Electronics India Pvt. Ltd. has been invited by Tata Motors as a preferred vendor to participate in the Energy Conservation & Renewable Energy Expo. The expo, which is held during 7th & 8th Feb is organized by Tata Motor’s Lucknow Plant. The interactive exhibition focused on the energy efficient products, renewable energy products, technical presentations and exploration of using new and renewable energy applications. 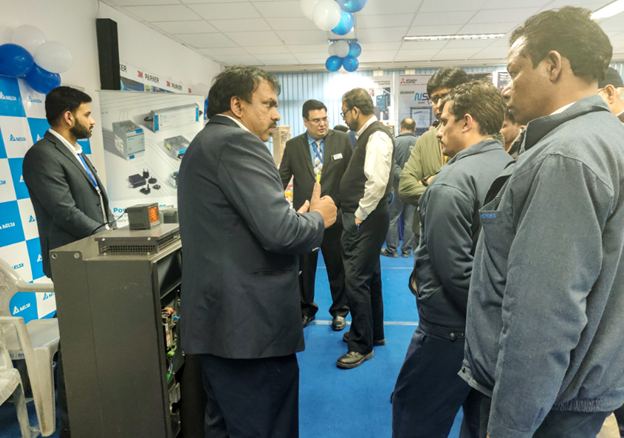 Delta, a world-class provider of industrial automation solutions showcased its power efficient solutions which includes Active Power Filter, Drives, Industrial Power Supplies, Power Meter and other Energy Management System products. Mr. Manish Walia, Head, Industrial Automation Business Group, Delta Electronics India, said, “It’s an honour for us to be a part of this show of Tata Motors. This is a recognition to Delta's long-term commitment of Powering Green Automation by offering innovative and energy-efficient products and solutions as well as quality services. We will continue with our endeavor to provide our partners smart, reliable and the most energy-saving solutions." A number of visitors, including the Tata Motors representative from planning, manufacturing, maintenance, design, utilities, supply chain department visited Delta stall and interacted about Delta’s products and solutions. The exhibition was inaugurated by Mr. Pramod Choudhary, Plant head Tata motors Lucknow. Mr. Sanjeev Srivastava, Director-Global Accounts, Delta Electronics India was also present in the inauguration ceremony and joined senior team of Tata Motors in lamp lighting.